A lush garden surrounds the house with typical Catalan architecture. Also at 50 m from the town center, shops, bars and restaurants give you plenty of choice. Girona Airport is 25 minutes from home and Barcelona 1h. 1- 1st floor: 2 double bedroom, 1 bathroom, kitchen and dining entire team live. 2- Ground floor: 1 suite, 1 double bedroom, 1 bedroom with 2 bunk beds, 1 bathroom, 1 living room and 1 kitchen. Rates vary by season. Consult us. aquatic parks and attractions, 5 min. Spectacular! The perfect location to relax with easy access to fun & food! We had a wonderful time relaxing in this well-equipped home and loved that we could walk out the gate and be in the sand on the sea. The home was very clean and comfortable. Parking at the rear was a fantastic bonus. Dining and entertainment was close by and it was a five minute walk up to the main "strip"; grocery stores, bakery, and meat markets were also an easy walk - less than 10 minutes. Our host was available and responsive to answer any questions. Highly recommend! The house is in a great location, right on the beach but also very close ot the town and with lot so restuarants nearby and well equipped. The garden is lovely and a great place to sit in the shade. Cristina was very good at attending to any issues. The only criticisms I have are that the description of the lower flat did not include that the suite is connected to the rest of the flat through the main entrance which is shared. Meaning our elderly parents had to lock and unlock doors to come into the main flat. This was very inconvenient, especially since we had only one set of keys. A better description and more keys would have been useful. Finally the alarm on the property went off, there were no instructiosn on how to turn it off. That would have been useful. Sra. Jennifer Ross; ha sido un gran placer tenerlos en casa. mi costumbre es dejar dos juegos de llaves, Cuando Ud. llego estaba al extranjero y la persona responsable de acojerle, penso que era suficiente con una. tenemos una entrada principal que se comparte; si Ud. desea caso contrario la suite tiene su propia entrada-salida por el jardin trasero. La alarma siempre la dejo desconectada, si una familia desea utilizarlo antes de tocarlo me preguntan y les explico el funcionamiento. hemos tenido falta de comunicacion y le hubiera podido evitar estos inconveniente; Espero que pueda comprender mis faltas; que estoy Segura que los evitare en las visitas de las proximas familias. Cristina's place is the best!! Incredible location by a beautiful beach. Much more better that seen in photographs. Confortable, newly equiped and decorated. Everything is perfect. Cristina is very kind and responsable. Gave us quickly attention to our questions and a warm treatment. She, and her house, made us feel at home, in family. 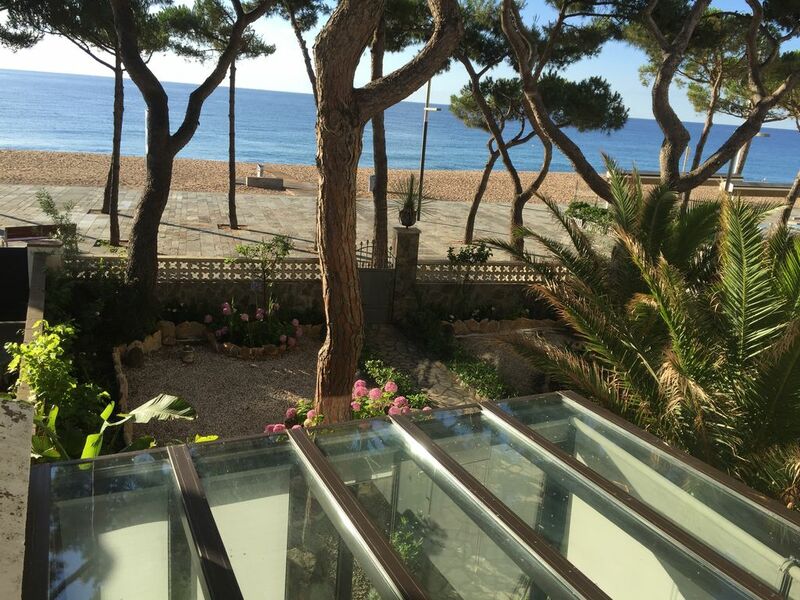 Playa D'Aro is a perfect place to have beach vacation, close to every place in Costa Brava. i am glad that you have enjoyed your vacancies in my house. Cristina was very helpful and easy to deal with. They were waiting for us upon arrival and were very helpful. The beach was beautiful and Play D'Aro was fun, safe and full of great restaurants. Strongly recommend the area and especially the house as the location and quality were perfect. Rested in this place for 11 days. I liked it very much. Nice house, 3 bedrooms and living room with kitchen, full furnishing, everything you need for a good rest. Value for money is very good. The meeting and departure were well organized. There were 2 small minuses: in one room the air conditioner did not work and slow WI-Fi . In general, everything was great! Siento mucho el inconveniente de internet , espero un dia que el ayuntamiento y telefónica se decidan hacer obras y solucionar el problema de mala conexión que tenemos por momentos. Esperando volver a verlos nuevamente, reciban un cordial saludo.